Top temples to see in Siem Reap! 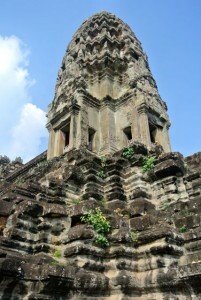 If you are visiting Siem Reap than chances are, you are here for Angkor Wat and the other amazing temples of the time. There are lots of them, so check out my recommendations for the top temples to see in Siem Reap and how to make the most out of your visit! 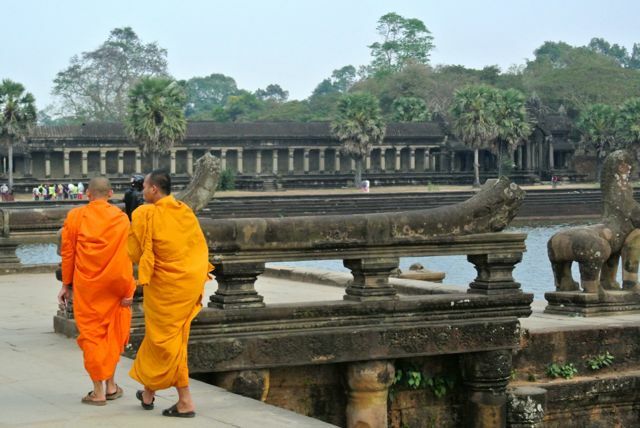 To make the most out of your visit, you should hire a driver to see what you want to see and when you want to see it (check out my tips Angkor – How to Get Around). Talk to your driver about what you want to see and whether you want to follow the most popular trail or rather prefer to avoid the crowds and go against the stream. The single most impressive temple is Angkor Wat itself, with its amazing design that shows itself slowly as you approach across the causeway. You first only see 3 towers, like a 2D image, but as you get closer and walk to the ponds (my favorite place to take pictures) you see that there are really 5 towers, 1 at the center and 4 on the corners, with multiple levels and countless doorways and decorations. Angkor Wat is very popular at sunrise – and the most crowded and not that great for photos, really. Arrive 1 hour after sunrise and you are after the sunset crowd and before the regular morning crowd to explore the temples in a more peaceful setting. When you return for a second time on your trip (and you should), ask your driver to drop you off at the back for a different view and experience (and meet you at the front). 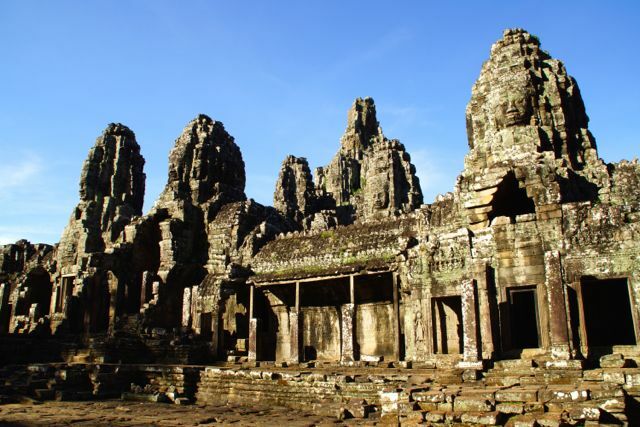 The next stop on the “small tour” taking in the central temples is Angkor Thom, the ancient Khmer city with a number of great temples in one compound. It makes for a bit of a walk, but it’s well worth it to walk around the sight for a bit to get an idea of the layout and the pure size of it. You’ll end up at the Elephant Terrace – just imagine a parade going by when you stand on top to appreciate the grandeur of this complex. Not far away is one of my favorite temples, Ta Prohm, the jungle temple, made famous by Angelina Jolie in Lara Croft: Tomb Raider. 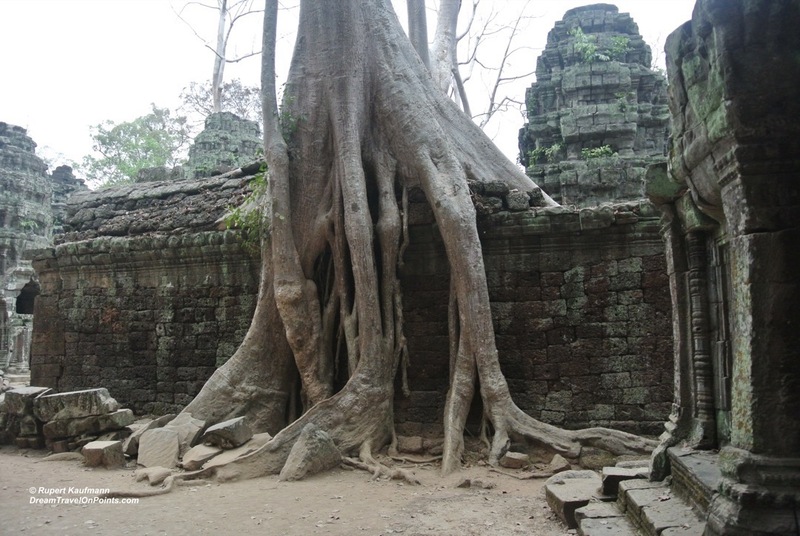 Nature has overwhelmed this temple with trees overgrowing the structures and giant roots holding walls. It’s a unique temple and great to walk around and take photos in. It is famous and also very busy, so its worth asking your driver to take you at a time not so busy. If you have energy for a few more temples, I’d suggest to take in some of the further away locations. 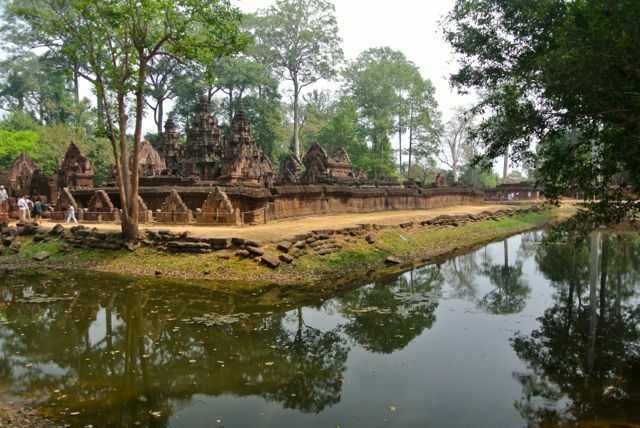 One of the most beautiful ones is Banteay Srei, or Citadel of the 1,000 Women. It’s a smaller temple, beautifully set with a moat around it and beautiful carvings throughout. Because of its size and beauty, it also gets crowded, so it’s worth exploring during “off hours”. 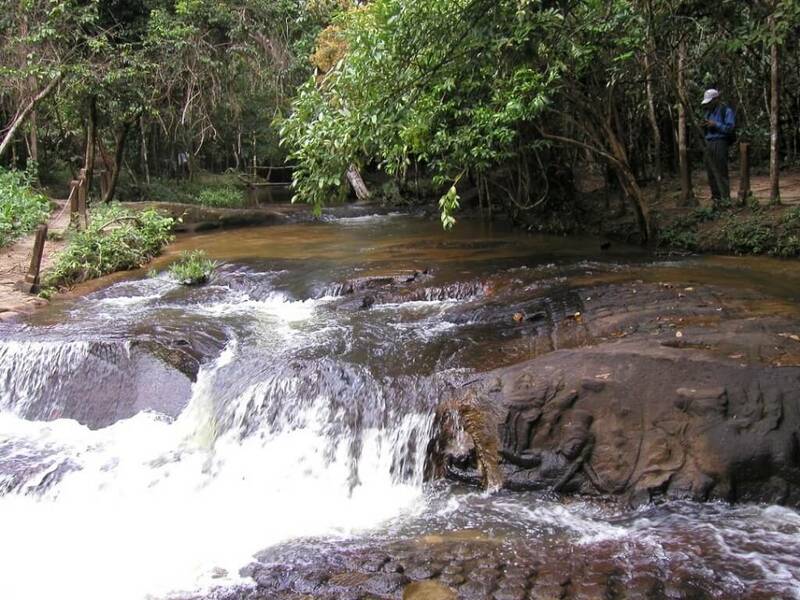 If you have made it this far, you should also consider visiting Kbal Spean. It’s a unique historic site also known as “The River of a Thousand Lingas”. Carvings of lingams, fertility symbols, have been made into the sandstone of the riverbed, supposedly to bless the water flowing into the reservoirs for drinking and agriculture during the time! You have a short hike through the cool forrest before seeing the carvings. The river is pretty shallow, so there is no problem seeing or photographing them! 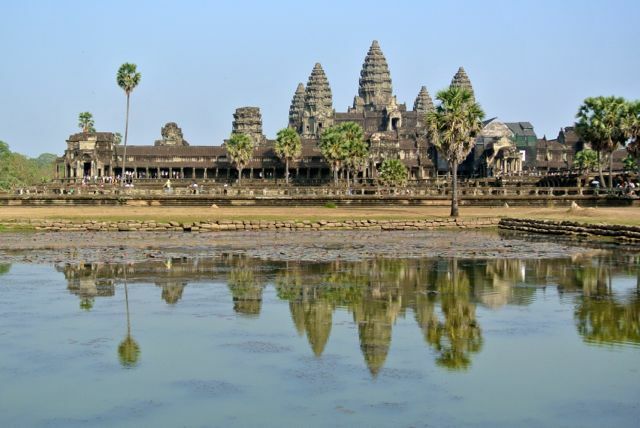 Other things to see & do: If you are “templed out” after a few days or just need a break from the heat, there are a few museums to see in Siem Reap as well: The Angkor National Museum provides some historical context. It’s reasonably well done and good for a rainy afternoon. If this is your first visit to Cambodia and only destination in the country, you might want to check out the Landmine Museum or the War Museum – Cambodia had a tough history and didn’t emerge from war until 1994, leaving the country – and its people – deeply scarred. While it’s tough to take in the history, it’s absolutely worth a visit and provides a valuable background for your visit to the country! If all this running around has you tired, fear not: Siem Reap has so many massage shops, from the little street stall offering a massage for under $10 to luxurious spas at the nice hotels, to loosen up those tight legs or ease your jet lag – don’t miss it before you head home!